I’ve never seen a dead body. Before this century, it would have been rare to reach my fourth decade in this state of ignorance. Today it’s common – unless of course you enter one of the professions to which we outsource death. Police officers, paramedics, nurses, doctors and undertakers shield us from the physical presence of death. So how does it feel to be one of those people? Medical students pick up a scalpel and confront a corpse in their late teens. As junior doctors, they come up against the rough edges of life and death on a daily basis. Does it make them blasé, or are they haunted by the inescapable ending? Does knowledge take away fear – or intensify it? And what have they learned about how to achieve a good death? One of the perks of my job is asking impertinent questions like that. I talked to a geriatrician, a GP, an accident and emergency doctor and a palliative care specialist, to see how death had changed their lives. 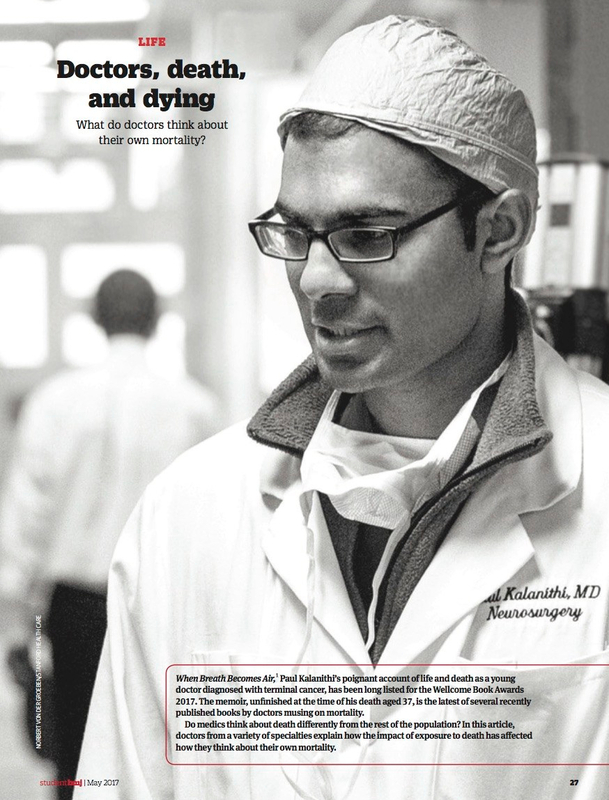 You can see their thoughtful responses in my article, Doctors, Death and Dying, for Student BMJ. My sheltered experience of mortality doesn’t mean I haven’t encountered death, of course. I seem to have been to too many funerals in recent years – friends, neighbours, family. These deaths are experienced as absences. The person is simply, upsettingly, not there any more. One friend whose absence leaves a particular void is Ingrid Beazley, a dynamic presence in my neighbourhood, where she gathered and galvanised artists, writers and musicians with unfailing generosity. Before she died, Ingrid recorded an interview with a mutual friend, Yang-May Ooi, about living with a terminal illness. Her bravery, love and wisdom deserve to be widely heard. You can watch the video on YouTube.